MARK Taylor believes that his career has been characterised by 'thinking big' and having the perseverance to ensure that his plans, which are often innovative, reach fruition. He has spent the last 30 years in the property development industry; starting off small in the residential sector and then progressing to catalytic type developments like Simbithi Eco Estate in Ballito. The eLan Property Group was founded in 1997 and has become a leader in real estate marketing and sales, sales of hospitality investment projects and more recently has diversified into other investment opportunities. Zululand Tree Lodge in Hluhluwe, the first venture undertaken, was a R12 million development. Taylor's desire to innovate was apparent in the Riverside Hotel, which became a sectional title hotel. This was a first for South Africa and has been the country's most profitable sectional title hotel and a true eLan success story. Taylor commented, "The pioneering and innovative approach does not always pay off, staying ahead of the curve is not always clever, as one is constantly meeting new obstacles, which have not been dealt with before. If you persevere through all the issues, you will be successful." 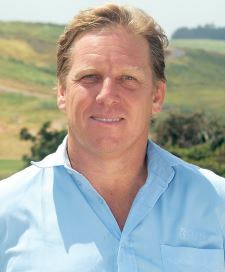 His determination to 'make a difference by doing things differently' is very apparent in the Blythedale Coastal Estate. An important part of this project has been in obtaining community buy-in, which has well illustrated Taylor's perseverance. "This development has taken 19 years of planning and community negotiation to come to fruition and is now going from strength to strength and will be a great success story." "Our success is based on not just selling off pieces of land, but we have created a concept for family living which we are now taking to a new level," said Taylor. Blythedale Coastal Estate is the most forward-thinking development in South Africa. "The emphasis is on fibre connectivity, frictionless access, green technology solutions, and most importantly, it is a community based development." Taylor added that creating jobs and promoting small businesses is in important in driving these projects. "We aim to contribute significantly to the local population." Blythedale Coastal Estate is the blueprint for inclusive housing in South Africa, to the extent that it has been presented to Parliament. The Estate will include an impressive 1 200 sleeper anchor resort hotel; a 3600 sleeper low-rise hotel villa complex; a retirement village; 250 luxury sectional title apartments; 2400 freehold homes; and 709 affordable homes linked to some 600 homes for gap housing. Taylor commented, "Success is dependent on the team that you build around you. Each individual is often better than you at what they do, and it is important to give them the responsibility and freedom as well as the authority to do what they do best." His current mission is to grow the eLan Property Group brand. He says, "Exciting things are happening. I intend to work smarter not harder and use the experiences that I have had to be more productive and proactive." He added that the commencement of deals and putting everything together is something that he has continually enjoyed and that he is currently exploring opportunities for development in Mozambique, Zimbabwe and Mauritius. Through the efforts of the eLan Group in exploring the potential overseas property investment market, and in particular the UK, South African Properties Overseas Marketing Association (SAPOMA) has become a reality. SAPOMA is administered and coordinated by eLan Marketing, and through its overseas division, eLan International, the Association will represent those developers and allied professional organisations who have the vision and urge to become part of the world global trading scene. Taylor says that his family have been crucial to him throughout his career and provide him a lot of support. This support has allowed him to continue in his various endeavours, while often facing stress and dealing with the challenges that accompany property development projects. Although works takes a lot of his time, he does try to include time for travel with his family and opportunities where he can relax by spending time skiing or fishing.